Can you name all the different types of insulation off the top of your head? If you’re like most home and business owners, you probably just there’s only one type of insulation: the pink stuff. 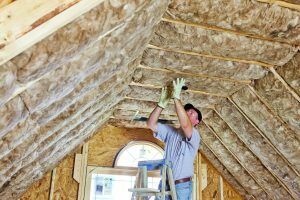 However, there are a variety of insulation types, and it’s easier than you might think to educate yourself on what they are, and the best ways to use them. Concrete block insulation is typically paired with high-tech foam beads, trapped air, or specialized cells that dramatically increase its insulating power. Although concrete block insulation requires a professional installer, it’s a great option for newly constructed homes or those undergoing renovations. Concrete forms are a bit more versatile than concrete blocks, but the same characteristics and restrictions apply. Concrete forms are typically built into walls, creating a snug seal, however, they are difficult to install in existing walls. Blown and sprayed insulation is ideal for post construction in crawlspaces, attics, basements, and other areas that can determine a home’s rate of heat loss or retention. Blown and sprayed insulation is used when there are hard-to-move obstructions. Blankets and rolls are easy for contractors to install and can be used in the same spaces as blown and sprayed insulation. Rigid fiber insulation has excellent fire resistance, making it ideal for structures that might otherwise be fire-prone. Rigid fiber insulation isn’t a substitute for fire extinguishers, sprinklers, and other safety measures. These systems are ideal for framing windows and other areas that determine heat retention and loss. They’re typically used as a complement to structural insulation systems. For more information on insulation or to get a recommendation on the best type to use for your home or business, contact USI online to find a branch near you and get a free quote. USI believes that excellence in every step of the process and ensures timely completion and quality of service, time after time.